Do you often dream of Swimming underwater to explore underwater life with various fishes, sharks and other marine creatures? 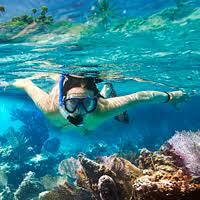 If yes, then a snorkeling tour is the best for you. At Andaman Island, you can experience the underwater coral structures and shallow reef areas by signing up for a snorkeling activity. Snorkeling is a diving practice conducted under deep waters with various diving equipment such as a shaped tube known as snorkel, diving mask, and fins. On a beautiful tropical location, what else do you need if you have a snorkeling mask and a wetsuit? So, do not miss this mind-blowing experience and book your snorkeling trip now.